We were very lucky to receive some really great new kid’s adventure books in the mail recently – the Lonely Planet Kids Unfolding Journeys books. Ever since my very first solo-travel days, I have always taken a Lonely Planet guide along with me on my journeys. So when I heard that Lonely Planet also produce travel books for kids, I knew that they would be worth checking out! We received the two latest additions to the popular Lonely Planet Kids Unfolding Journeys series. “Following the Great Wall” is all about the Great Wall of China, and “Secrets of the Nile” explores Egypt along the River Nile. Other great books in this series include Amazon Adventures and Rocky Mountain Explorer. These children’s books are big, bright and colourful – a real hit with kids. My girls Samantha and Brooke, ages 9 and 11, absolutely love their new books – and I must admit that now that I’ve taken a closer look at them, I can understand why. Beautifully illustrated, Lonely Planet Unfolding Journeys kid’s pull-out frieze books take their young reader on a magical trip of knowledge and adventure. They highlight famous destinations, including their ancient and modern sites, fascinating geographical features, plus so much more along the way. The book pages fold out accordion-style to a 6 feet – or nearly two-metres! This means that kids read them as normal, or open the fold-out frieze to lay along the floor to read. Another option is to pin up the removable frieze as a beautiful wall display. It’s a very adaptable and engaging design, and really sparks a child’s imagination – and their desire to travel! Even though our family has been lucky enough to have already visited the Great Wall of China, the girls now know much more about it, thanks to their Unfolding Journeys book. They are both very eager to visit Egypt now too, since reading their Secrets of the Nile volume. Unfolding Journeys really does unfold – to 6-foot long! A brilliant boredom-buster, the attractively laid-out information is delivered in short, interesting sections by author Stewart Ross. Gorgeous illustrations feature all along the opposite side. This format works really well to help keep kid’s attention focussed, yet not overload them. This also makes these books the perfect road-trip or flight activity companion – occupying young minds with something other than mind-numbing games tablets! They are a great reading size for children too, yet lightweight enough for kids to carry around with them. Our books have already been all over the place with us – the kids just can’t put them down! Children will enjoy many hours of discovery and entertainment to be had within the pages of these delightful children’s books. There’s just so much to read and absorb in Lonely Planet Unfolding Journeys books. Two weeks on after receiving theirs, Brooke and Samantha are still discovering new facts. It’s really rewarding as a parent to hear my children excitedly sharing random geographic or historical facts. They are proud to show-off their new-found knowledge to anyone who will listen! 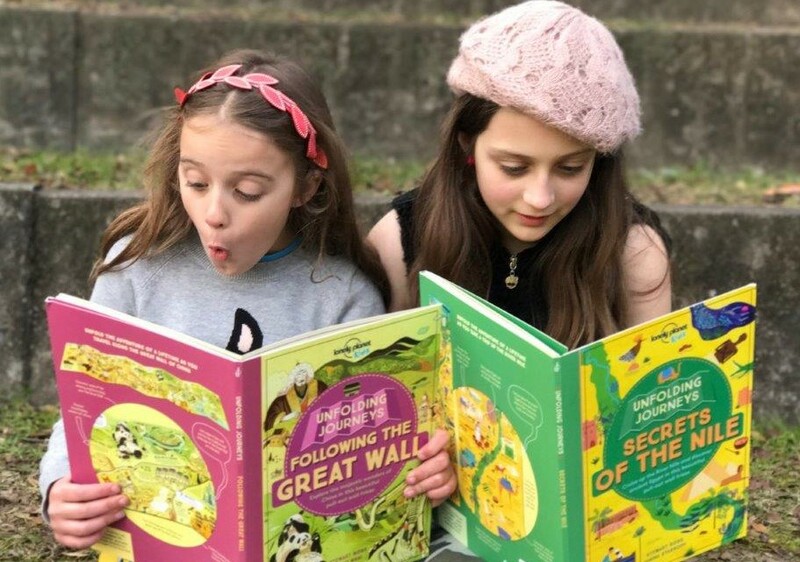 Now my girls want all the books in the Unfolding Journeys book series – and I’m enjoying that they are unknowingly learning so much, whilst being entertained at the same time. Lonely Planet Kids Unfolding Journeys books would make a great gift for little adventurers, and are a fantastic addition to any childhood library. Lonely Planet Unfolding Journeys books suit children from ages 7 and up, and retail for $24.99 each. To learn more or purchase Lonely Planet Unfolding Journeys books, or other books in the Lonely Planet travel book range, visit the official website here. The Let’s Go Mum family received the Unfolding Journeys books from Lonely Planet as unsolicited gifts. We are an independently owned website, and all opinions are our own. This article may contain affiliate links, which means if you click through and make a purchase, we will receive a commission at no extra cost to you. What are your favourite travel books or activities to keep the children occupied on planes, trains or automobiles? Comment below! These books like they need to be added to my collection! Hi Christine – yes, they are really great, the girls love them – still going on them! Thanks for your comment.